The man who did more than anyone else to put together both the first ever Mesoamerican Birding Festival and the familiarity trip after the birding festival, Robert Gallardo, does more than organize and lead birding tours (though that is certainly a full-time job in and of itself). He also runs, with his lovely wife, Irma, an eco-business in the town of Copan Ruinas, the Enchanted Wings Nature Center. Currently, the center consists of an enclosed butterfly garden, a preserved butterfly collection, a butterfly breeding program, labeled plants throughout the property (which has a bird list of over 100 species), and an orchid house. Robert has plans to eventually expand to include cabins and become a full-fledged ecolodge (to say nothing of wanting to build reptile, amphibian, and insect exhibits). I am sure that once the cabins are built that the ecolodge will be a wonderful success, at least, if the butterfly exhibits serve as a template. But before I get to the butterflies let me first share with you one of my favorite birds of the whole darn trip to Honduras, a bird that was hanging out in a tree over the entrance to the Enchanted Wings Nature Center, a bird that Robert said occasionally is caught eating food from the dogs’ bowls, the amazing White-throated Magpie-Jay, a bird that deserves a full 14 on a 1-10 scale of awesomeness. I just wish I had gotten a shot that did the bird justice. 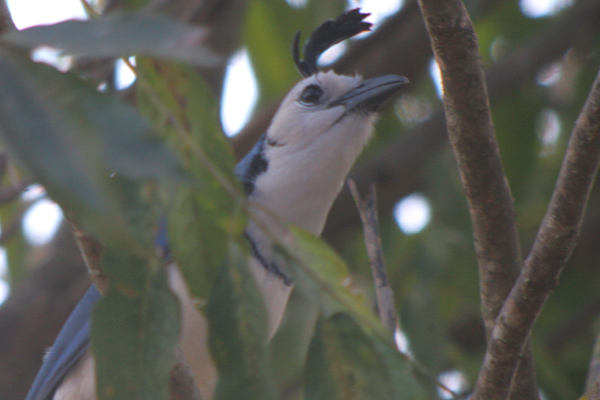 How can one not be impressed by a jay with a headdress? It was one of three life birds our brief visit to the nature center provided me (Rufous-browed Peppershrike and Rose-throated Becard were the other two). And we weren’t even there for the birds, but to check out the butterflies and the orchids. 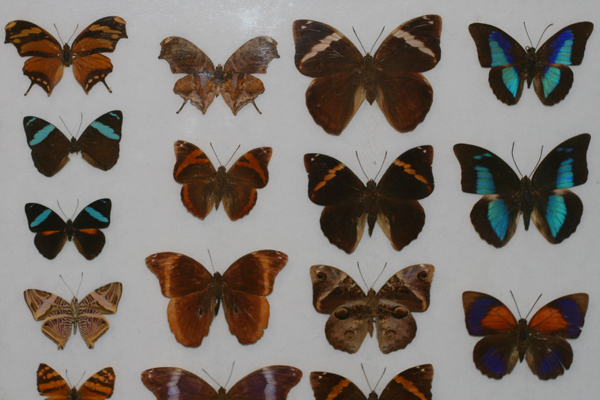 The butterfly collection was colorful and impressive, at least to this non-lepidopterist. 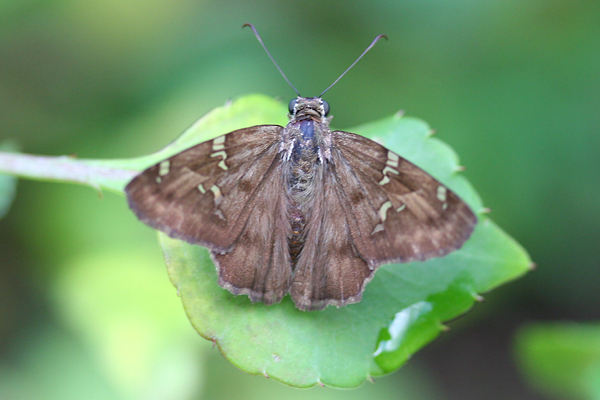 Even more interesting than the specimens, however, were the living butterflies in the butterfly enclosure. And even cooler than the live butterflies was seeing them pupating. 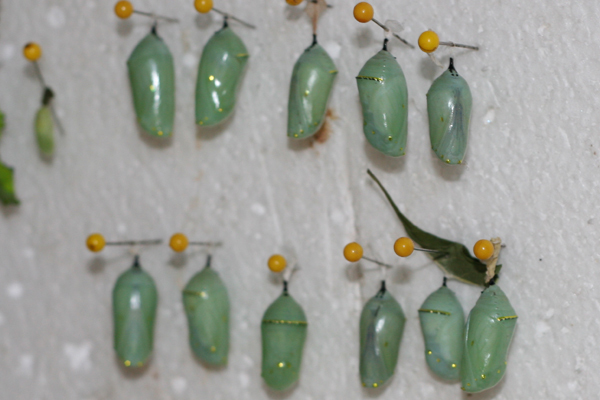 The variety of chrysali (is that the proper plural of chrysalis?) was fantastic, and though we weren’t there to see the butterflies emerging we were told that often visitors are fortunate enough to see butterflies emerging from a chrysalis that a caterpillar created. In all seriousness though, the Enchanted Wings Nature Center is certainly worth a visit if you’re in Copan Ruinas, which, if you visit Honduras, you most likely will be. The ruins in town are great (and I’ll get to them soon, I promise) but they won’t take more than a day to check out so while you’re around you might as well learn a bit about the natural world of Honduras, and I can’t think of an easier and friendlier place to do that than the Enchanted Wings Nature Center. thank you, corey! I live in Honduras and am looking to take a birding trip with a local guide – and it looks as if robert gallardo will be the one! @Jane: You won’t regret it one bit. Good luck! I brought my camera and sketchbook but arrived breathlessly at closing time. Robert of Enchanted Wings still, graciously allowed me a leisurely visit. I teach natural science illustration/botanical arts/field sketching workshop/retreats to top museums and universities internationally and think this might be an opportunity to bring a group there. Thanks for the work you are doing as well Corey!